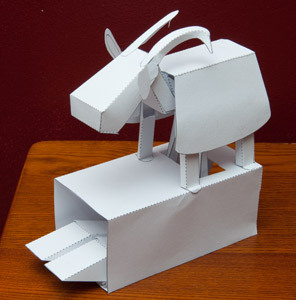 After a small herd of iterations I've finally got the XOR-goat to work. The basic mechanism is unchanged but the geometry has changed a fair amount. There are a couple of small changes I need to make as I work on the parts layout then it's 'add colour' and 'write instructions'. Should be ready in the first half of next week I reckon. Herd, heh! I don’t know anything about XO but I definitely have a thing for goats and so will be happlily downloading to finally get my own! w00t!